Lucy's Cards: Happy World Card Making Day... and a giveaway. Today is World Card Making Day, and Studio Calico are joining in the celebrations. They have a fab promotion available (HERE) along with some fun card challenges with prizes and even the opportunity to win a spot as a guest designer for a month in 2014. FUN!! I hope you get a chance to play along... Entering is easy, just upload any cards you create to the SC gallery and then go to the challenge page and leave a link to your card in the comments section. Enter lots of times and you have more chance of winning. Yay! And to celebrate WCMD, how about a little giveaway. Deadline for entries is Wednesday 9th October. Love your card! You did great with the challenge. I'm hoping to play along with some challenges today for WCMD. Happy WCMD everyone. What a gorgeous birthdaycard here Lucy. Great coloring as always and with such gorgeous colors on it too. I love your cards Lucy and your blog has been a constant source of inspiration for me over the years. I hope to get a few cards done this weekend too. Gorgeous card! I would love to win some goodies from you! Thank you! This card is absolutely gorgeous. It is so FALL. Thanks for the chance to win some goodies. I really like your card! And you're right, it would be a great way to use up scraps. I plan to immerse myself in cardmaking today & get a collection to pull from when an occasion pops up! Beautiful choice of colors-happy wcmd everyone. so nice of you to do a give away! HAPPY WCMD!! !Awesome card,Thanks for sharing!! Beautiful card. I will be making some sympathy cards and maybe some halloween cards today. Thanks for the chance to win. Just love your card and the orange paper. I am all ready to make a bunch of cards today! Thanks for the giveaway! Beautiful card with all the lovely colours, Lucy! Will try to catch up with my Christmas cards! Cards, as ever, look great! I am planning on "using my scraps," always nice to have fancy photographs for Xmas presents! Love your card - rainbows are fabulous! I've already made a couple cards today and hope to play along with some of the SC challenges. What a fun day! Lucy, this card is gorgeous. Love ther brightness and choice of papers. Thanks for the chance to win your giveaway! I'm hoping to get in my stamp room shortly. Love your card!! I made a Halloween card today. I wanted to do more but not enough time! 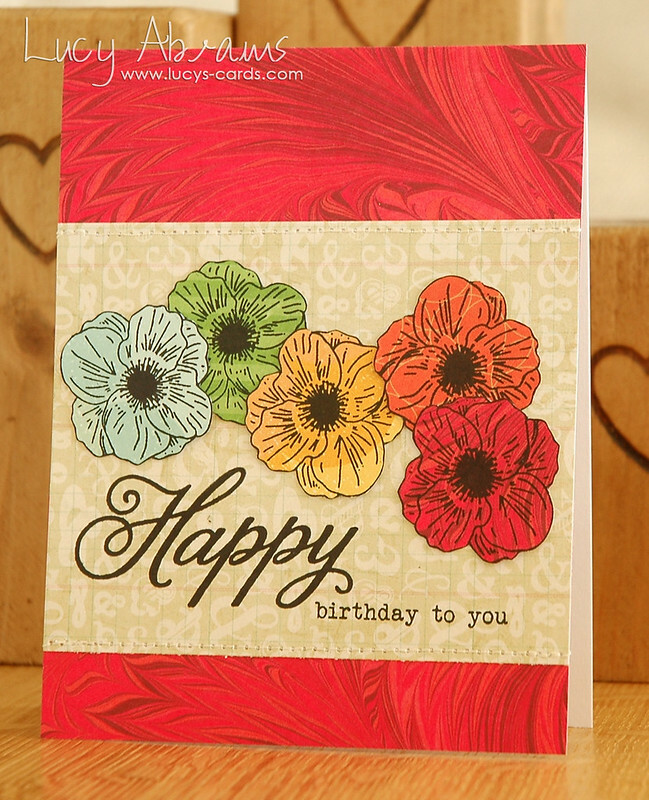 Love your card and the vibrant colors! I've made some cards today for WCMD and need to get them uploaded to the SC gallery! I hope to - I have so many cards to make .... but the day is slipping away! Happy WCMD! Gorgeous card, love the colors! I plan on spending the day crafting! I was planning on crafting but an unplanned trip to the vet with my dog took up most of the day. fabulous card, I'd better stop procrastinating then! Wow, this is such a beautiful card! I really love all the paper pieced flowers and the wonderful colors you used. I spent today making cards for some of my crafting friends! I started a card today, I will finish it when I get my Distress Clear Rock Candy glitter later this week :) Thanks for the chance to win some goodies! Wow gorgeous! Love those flowers! I actually was celebrating my sons 5th Birthday but my sweet hubby is letting me craft tomorrow, yay for family time and crafting! I am making a set of 14 ATCs for a swap I have coming up on Tuesday! Happy WCMD to all! Thanks for sharing your beautiful card on World Cardmaking Day! And thanks also for the chance. I did some Birthday cards for my nephews. I was hoping to create for a bit but my kids and I aren't feeling well today. :( Maybe next year. Dang ... every year the cardmaking day falls on our Open House at the fire station, where I help fun the bake sale. And I always come home too exhausted to play. But I'll be playing and making cards today, for sure. 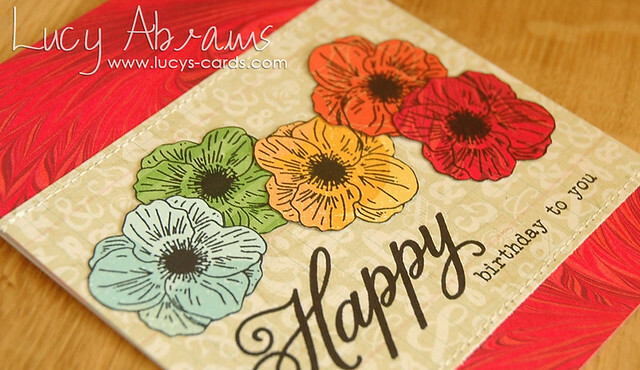 Love the vivid colors of this card, Lucy! Who wouldn't love receiving a card like this?? Thanks for the chance to win some goodies. I love your card Lucy! I am making Thanksgiving cards right now, because we will be celebrating Thanksgiving next weekend in here in Canada. Great vivid colors...I love it! Your card is gorgeous! Wish I had time to play but not for awhile! Just time to check everyone else's lovely work! Wonderful card,Thanks for the chance to win!! cute as card Lucy, I did manage three cards on Sunday afternoon here in NZ... so technically still Sat in the other side of the world! Your card is lovely Lucy:-) I made birthday cards for my niece & nephew who celebrate their birthdays 6 days apart:-) So fun!!!! Great card, I love the colors. Thanks for sharing and for the chance to win! Happy belated World Card Making Day, Lucy! Hope I can win your amazing giveaway.